Choosing where to go for your honeymoon is quite a task, especially after planning everything in the run-up to your wedding. Do you go for a honeymoon relaxing on the beach or head to a vibrant far-flung city with plenty of new experiences? With so much choice, it can become fairly overwhelming! We’ve reviewed many cruise ships before and we always fall in love with ships that push the boundaries. Cruising is started to shake off its old-day image and show just how luxury and modern it really is. By taking a cruise as your honeymoon, you can visit many destinations in one long trip. Plus, plenty of relaxing and great food. 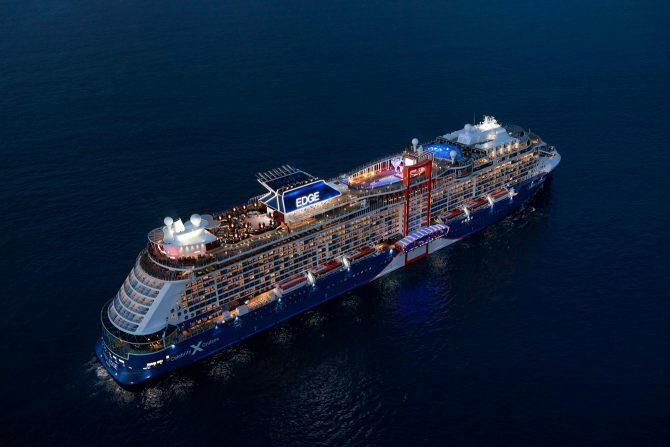 Launching this week is the revolutionary ship, Celebrity Edge and we are so excited to showcase what you’ll find onboard! From it’s cabins to outdoor areas, it looks incredibly inviting and luxurious. 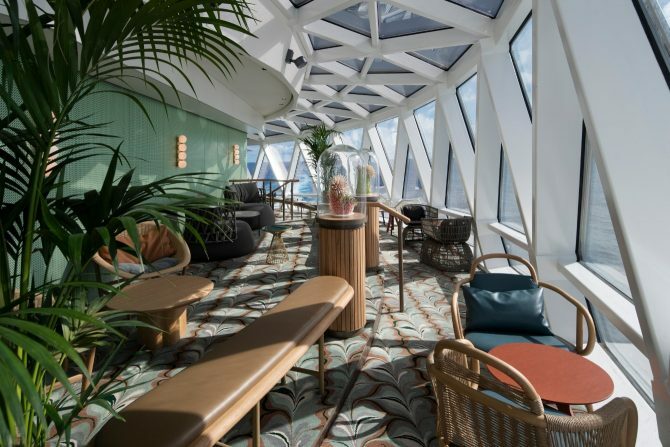 Onboard you’ll discover an outdoor Rooftop Garden, a Magic Carpet suspended on the side of the ship (this just looks incredible) and of course, stunning suites with some that feature open-air plunge pools and 270-degree views. SOLD! So what is this ‘Magic Carpet’? This is a stunning all-glass venue suspended from the side of the ship. 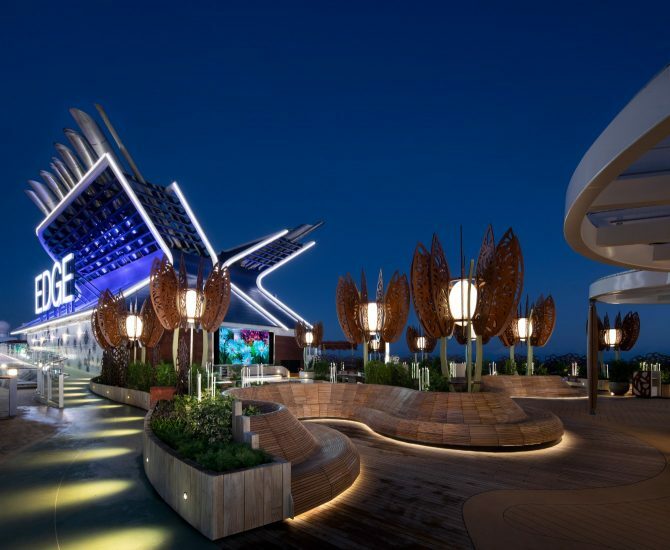 The first ever cantilevered venue on the ocean, the Magic Carpet moves 14 decks up and down the exterior of the ship. This offers unique experiences such as an exclusive restaurant, Dinner on the Edge to an embarkation lounge for the ship’s private luxury launches. 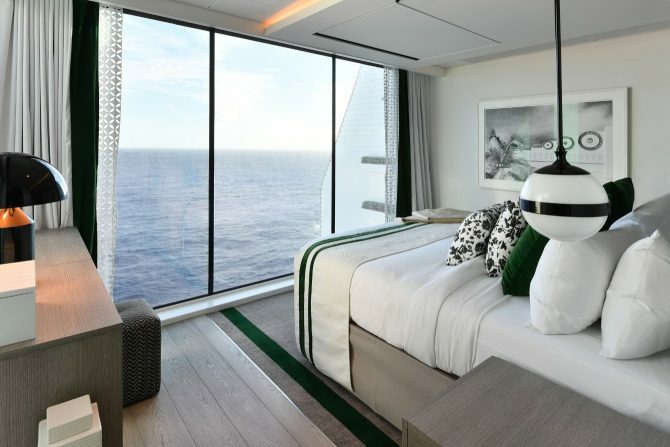 Accommodation on board is second to none and have been masterminded by celebrated interior designer Kelly Hoppen MBE. 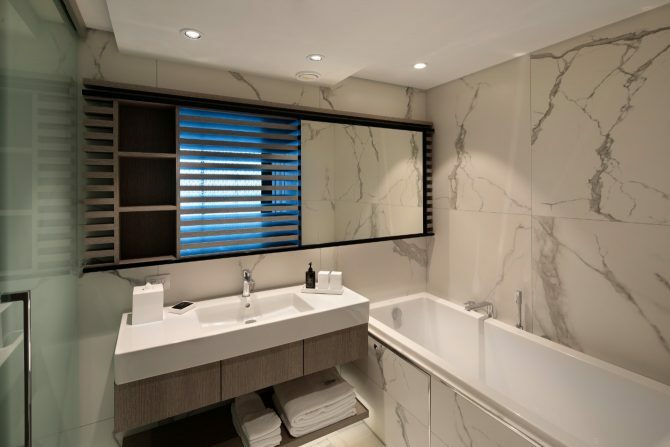 The feeling of bringing the outdoors inside appear on many of the suites with stylish Infinite Balconies that incorporate some outdoor space into the room. The tough choice you’ll have is choosing the perfect suite. Do you go for a twin-level villa with outdoor plunge pools or a suite with 82 feet glass vistas looking out to sea? The choice is yours! 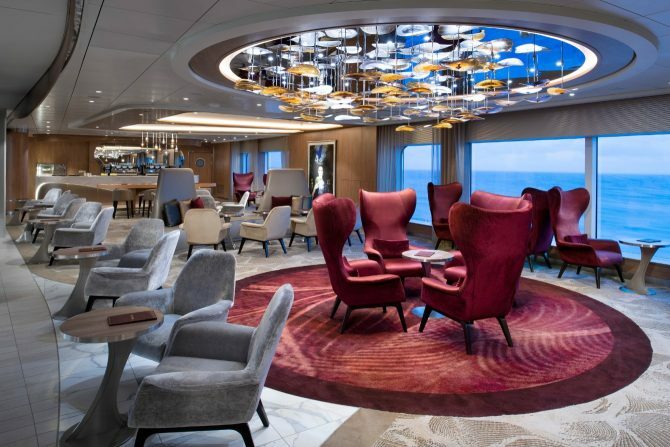 With so many stunning spaces on board the ship, there is one space that stands out from the rest. 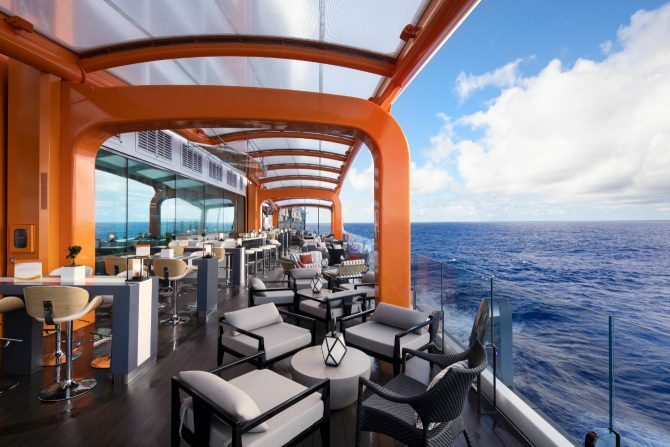 Eden spans three decks and offers more outward facing glass than any other room at sea. It was created by world-renowned designer Patricia Urquiola, architect Scott Butler and theatrical mastermind, Variety Worldwide. In Eden, you’ll discover multi-sensory fusion of one-of-a-kind culinary and entertainment experiences. There’s also an 18 feet tall Library of Plants living wall, higher than your average house. 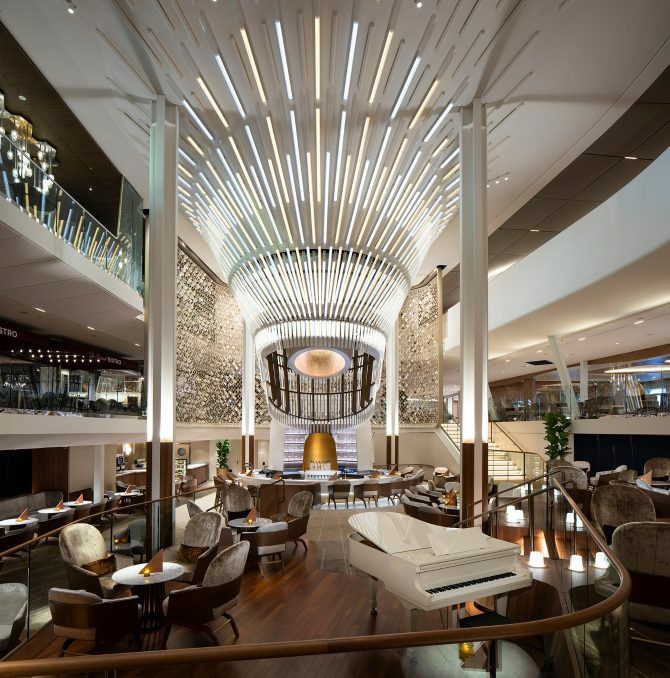 You’ll also experience 29 distinctive restaurants, bars, cafes and lounges on Celebrity Edge. With so many dining experiences, you’ll need to keep track of the ones you haven’t dined at! From a steakhouse and raw bar to Le Petit Chef, you’ll have many options to choose from. For a bit of relaxing, spending time in the spa and fitness centre is the perfect ideas. Designed by Kelly Hoppen, the centre provides a wealth of experiences you’ve never offered before at sea. At the heart is the SEA Thermal Suite, featuring eight nature-inspired therapeutic experiences as well as everything from quartz crystal treatment tables to the first Peloton bikes at sea. We are so excited to see the launch of this new ship. This is the first of four brand new vessels to be delivered between now and 2022. The second in the Edge-glass of ships will be the Celebrity Apex, which will launch and be based in Southampton in Spring 2020. 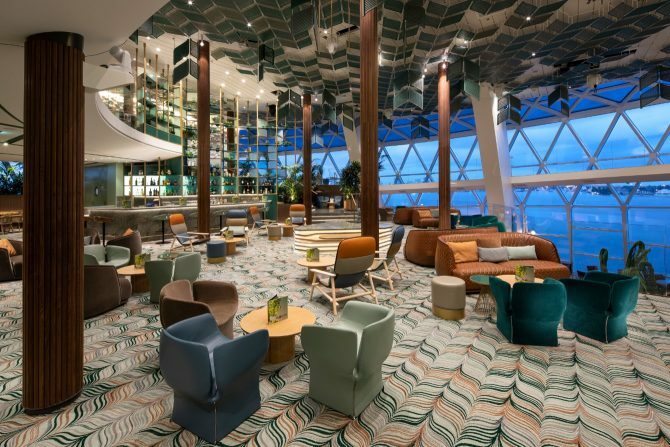 Celebrity Edge’s inaugural season of eastern and western Caribbean cruises begins on 9 December 2018. Prices for a nine-night Caribbean fly/cruise cost from £3,429 per person based on two sharing Infinite Balcony accommodation. The same cruise staying in an Edge Villa costs £24,300 per villa. Prices based on April 2019 departure.